Being in the moment - do young people know how to experience concerts anymore? I went to see Queen with Adam Lambert two weeks ago. It was, in a word, AWESOME. 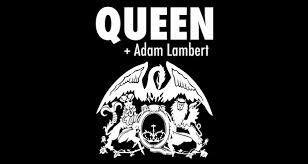 I'd seen Queen a while back with Paul Rodgers from Bad Company on vocals but I have to say that Adam Lambert blew Paul Rodgers out of the water when it comes to being a Freddie Mercury replacement. He's got the vocal chops and the flair. I was particularly thrilled because they played one of my favorite songs from A Night At The Opera, '39. By the way, did you know that Brian May is actually Dr. Brian May (and it's a real doctorate, not a fake one like so many folks have been exposed as having here in CT in recent weeks) with a degree in Astrophysics? I love it that one of my favorite musicians is so brainy. But there was one moment I found really depressing at the concert - and I wondered how Dr. May felt about it as the performer on the stage. He had this cool "guitar cam" rigged up to the neck of his guitar, so we could see his lightning fast fingers move during guitar solos. When he walked down the runway into the audience and stood playing right there, in front of them, only feet away, what did the guitar cam capture? Excited, exhilarated people entranced by the music? No. Rows and rows of fricking CELL PHONES recording the experience for later. I thought about the few times I've been lucky enough to be in the front rows of concerts. 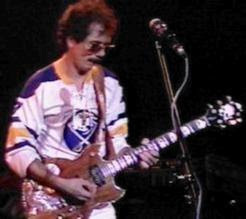 I was front row at the Palladium for Carlos Santana when I was in high school, and it was MAGIC. Okay we didn't have cell phones then, because I AM OLD, but even if we did, I was so INTO THE MUSIC, so completely involved with the wonder of the experience, that I can't imagine just holding the thing up and recording instead of just being there and feeling the music and grooving. Also, Carlos Santana smiled at me!!!! Would that have happened if he'd seen my cell phone instead of my rapturous, smiling face? I wonder how it must feel to be playing the Garden and instead of seeing the excited faces to see people just standing their with their cell phones. I can't help thinking that being a titan of Rock isn't what it used to be. It makes me understand why Robert Plant continues to steadfastly refuse another Led Zeppelin reunion (as much as I'd be tempted to remortgage my house to get tickets if he changes his mind). My friend Adam Bernard (keep an eye out for his hot self in my upcoming novel, BACKLASH) wrote a great piece on The First Three Songs Rule, and how it should become universal concert law. You go to a concert to have an experience, to enjoy a band you love, and to create a memory. The problem these people have is that they’re so busy trying to capture the moment that they don’t spend any time creating a memory to associate with it. Sure, they have a hundred pics from the concert they just went to, but, “Remember the time I held my arm up for 45 minutes” is not a good concert memory. Kids, take a picture or two then put the phone away. Let the music fill your soul. Be in the moment. And maybe, when you're middle aged like me, you'll remember the time that amazing guitar player whose records (okay, you don't listen to records, but you know what I mean) you played so many times the grooves got worn, SMILED AT YOU. I separated from my now ex-husband in November 2003, and our divorce was finalized in December 2006. When the marital home sold, I bought the current house in which the kids and I reside. I hold the title to this house in my own name, the mortgage is held by me alone, and I have made all the decisions about financing and re-financing this house myself. My ex-husband never lived at this address, was never on any of the mortgages at this address, has had nada to do with this house. Yet I still get mail addressed to him here, even ten years after we separated, and eight years after our divorce was finalized. 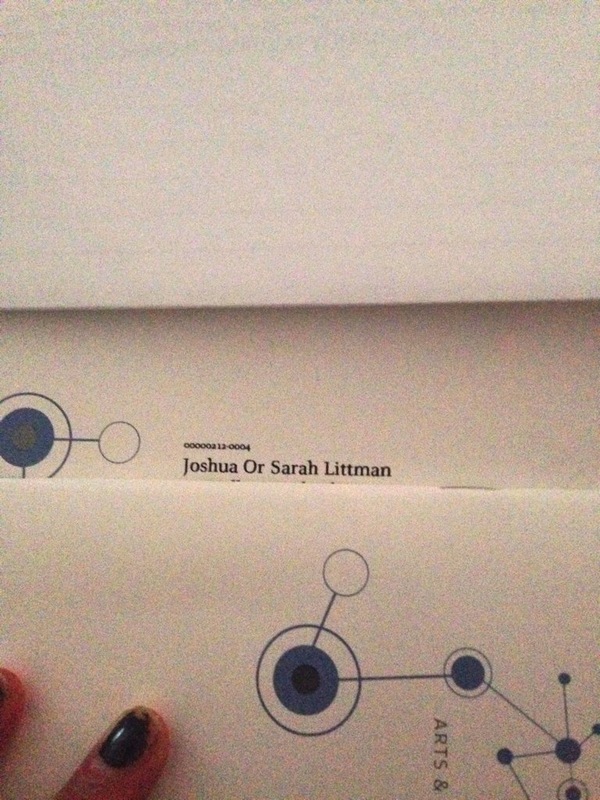 I even get mail addressed Mr and Mrs HIS NAME Littman at this address. About two years after the kids and I moved into the house, my son got an invitation to join the AARP. He was 15 at the time, and it was a source of much amusement to me, because I hadn't received my first AARP mailing yet (now I am deluged by them on practically a daily basis). Neither of us could understand why he would be on the AARP mailing list. "Maybe they figured that because you're the only male at this address, you're my husband," I joked. He looked at me with all the appropriate horror that comment would engender in a 15 year old boy. Well, recently my bank suggested I move to their private banking program. I met with a very nice chap, and before I signed on, I told him a very important story about how I feel about men giving me investment advice. A few years ago, I had my portfolio with an investment advisor. I wanted him to move my holdings in a certain direction, because as a political columnist I watch what is going on in DC very carefully, and I didn't like what I was seeing. He didn't agree with my assessment, and told me to "ask my father," before acting. Now there are a few things about this that pissed me off. 2. I was, at the time, a woman in my late 40's, with children of my own. 3. My father was in a nursing home with Alzheimer's, something that this person knew, because I'd bought a long term care policy from him, because of my concerns about developing Alzheimer's myself. 4. Did this guy realize he was living in the 21st freaking Century?!! OMFG!!!! As a result of that blatantly patronizing and sexist advice, I moved my entire portfolio away from that establishment, which lost them fees and commissions. MORAL OF THE STORY: BEING SEXIST COSTS YOU, CORPORATIONS. LIVE AND FREAKING LEARN. Well, yesterday I got some mail from my bank as a result of become a private banking client. Here is how the envelope was addressed. Joshua happens to be my son. He isn't the main account holder. I am. In fact, if the bank cared to LOOK AT ITS OWN RECORDS, it would notice that his account is a COLLEGE ACCOUNT. But no. Because his is a male name, it takes priority over the actual private banking client, ie/ ME. Now my boyfriend, who is a database guy, told me I was overreacting, because "it's just an algorithm." But when I posted this on Facebook, the number of FEMALE friends who have been similarly enraged by this was long and equally furious. "(Husband) and I are joint owners of our home and have a joint mortgage, but everything comes to him. With Allstate, we both have homeowner's insurance together, and then I have a policy on my car and my condo. But EVERYTHING comes addressed to him, even for my policies! I've had numerous convos with our agent and he is clearly puzzled as to why it infuriates me." "Do I know what that feels like! I think most women do." "My sister-in-law kept her own last name but gets mail to Mr & Ms my-brother's-name all the time. ALL the time. Grrrrr." Now my boyfriend may be right. It might be "just an algorithm." As one friend commented, "We can't control what the computer does" is what Allstate tells me when they send me emails about my policy that start with, "Dear Hubby's Name...". It's insta-rage for me when I read it." But here's the thing: WHO CREATES THE ALGORITHMS? * Computers don't program themselves, as any database guy should know. And whoever created the algorithm that takes any male name in a house and puts it FIRST, even though the policyholder, or the main account holder is a woman, even though that name might belong to a child, is not making a wise business decision. Here's a case where the marketing people need to go to their programmers and say FIX THIS. Because it's long past for "Big Data" to stop considering women as goods and chattel of the male of the species. *let's guess: Do we think this one was created by a man or a woman?